Pigmentation, better known as hyper-pigmentation, is a condition that darkens patches of your skin. These patches can be large or small. While the condition isn’t harmful, it can be a symptom of an underlying medical issue and can cause your skin to look uneven and unhealthy. Your skin gets its color from pigment-producing cells known as melanocytes. Melanocytes produce melanin which gives your skin its unique color. When the melanocytes are damaged, unhealthy, or pushed into overdrive they start to produce excessive melanin in certain areas, causing those areas to darken. 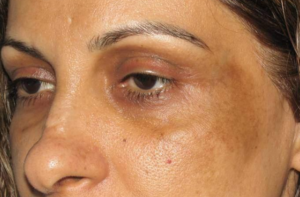 While a number of factors can lead to hyper-pigmentation, simple home remedies can reverse the condition in most cases. Following, I’ve put together, a list of 20 home remedies and tips that will help even out your skin tone. Hyper-pigmentation is a skin problem in which special cells called “Melanocytes”, that reside in the deep part of the skin called the “Basal Layer”, become over-active and start producing extra ‘Melanin’. Melanin is the pigment that gives the skin it’s color and this excess production of Melanin is a symptom of the over-activity of Melanocytes leading to problems like dark spots, patches on cheeks (melasma), stubborn tanning, etc. Hyper-pigmentation is very difficult to control because the over-activity becomes permanent and typical skin care products don’t have the right scientific approach to address the problem.